This treatment stimulates the skin to repair itself naturally and safely, by creating controlled micro injuries in the skin which stimulate the production of collagen and elastin, vital components of healthy skin. This treatment can be performed on the face and body to address fine lines and wrinkles, sun damage, scars, acne scarring and stretch marks. 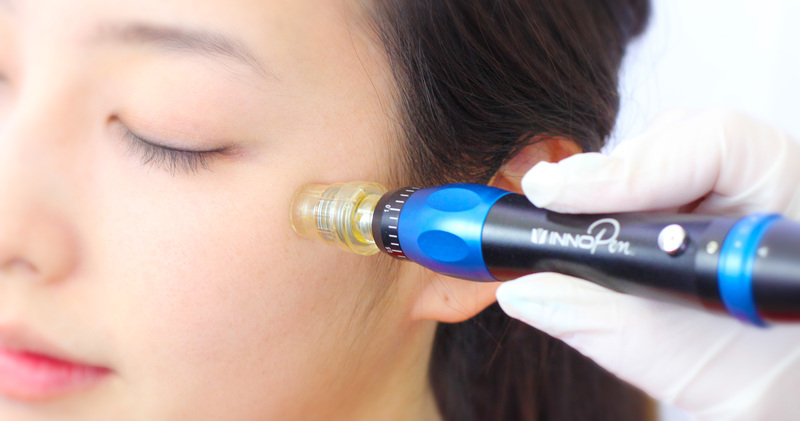 INNOpen is one of the world’s safest micro-needling devices, which uses an automatic vibrating stamp like motion to create micro injuries in the skin. INNOpen is manufactured in the US and offers high-quality, safe features unmatched by any other needling device. The INNOpen is fully adjustable with variable speed and depth settings which means it can be used on all areas of skin – even the thinnest skin around the eyes. Firstly the area being treated is cleansed and a local anaesthetic cream is applied to make the procedure as comfortable as possible. Once the skin has been numbed and cleaned the unique INNOpen device is placed onto the surface of the skin. Its motorised action creates thousands of tiny pin-pricks into the skin, causing micro-injuries which in turn stimulate the production of new collagen and elastin, so that the skin regenerates itself from within. The treatment also includes the application of specialist serums, where appropriate, which are absorbed through the tiny pin-pricks into the dermis where they can deliver active ingredients to address dehydrated, sun-damaged or hyperpigmented skin. The INNOpen medical skin needling device can also used in combination with specialist Mesotherapy solutions with the aim to improve hair growth in areas of hair loss, such as the male ‘bald spot’ and areas of thinning hair.